Most POPULAR GOURMET herbs:Basil, Chives, Cilantro, Dill, Lavender, Oregano, Parsley, Rosemary, Sage, and Thyme! ***Some of the above varieties of seed may be substituted, but are in the same family. 10 of the most POPULAR GOURMET herbs: Basil, Chives, Cilantro, Dill, Lavender, Oregano, Parsley, Rosemary, Sage, and Thyme. 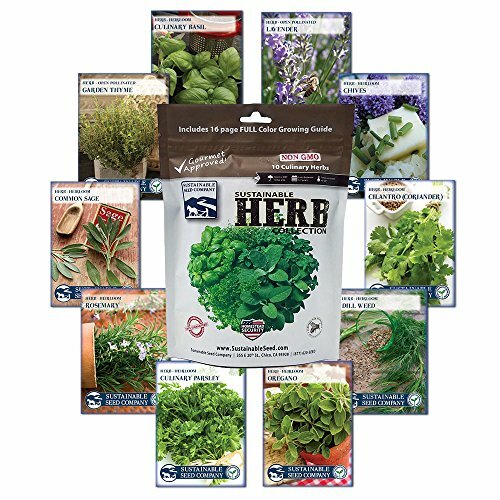 An instant HERB garden in one pkg! It's easy AND you get a 16 Pg full COLOR Growing Guide! Each eco-friendly, compostable herb seed packet includes detailed planting instructions, all sealed in a waterproof, resealable Mylar package PLUS, our professional MASTER GARDENERS who have been featured in the LA/NY TIMES and WALL STREET JOURNAL; are here to answer any questions you might have. Stop by our 13,000' facility FOR A VISIT! We are here to help you GROW! From a real LICENSED seed company. Real paper seed packets with an expiration date, lot # and germination number AS REQUIRED by Federal Seed Law. There is a reason seed companies have been using paper packets for over 200 years. Seed are living organisms that need to breathe. And these packets actually have planting instructions! Our UNIQUE WORKFORCE enables U.S. Veterans, troubled youth, 2nd chance and disabled Americans a fulfilling career. Allowing significant contributions to their lives, community and allowing Sustainable Seed to grow and give back to this wonderful country we live in. WE ALSO DONATE TO OVER 100 CHARITABLE ORGANIZATIONS globally. We believe in "Pay it forward"! THANK YOU for supporting us. If you have any questions about this product by Sustainable Seed Company, contact us by completing and submitting the form below. If you are looking for a specif part number, please include it with your message.